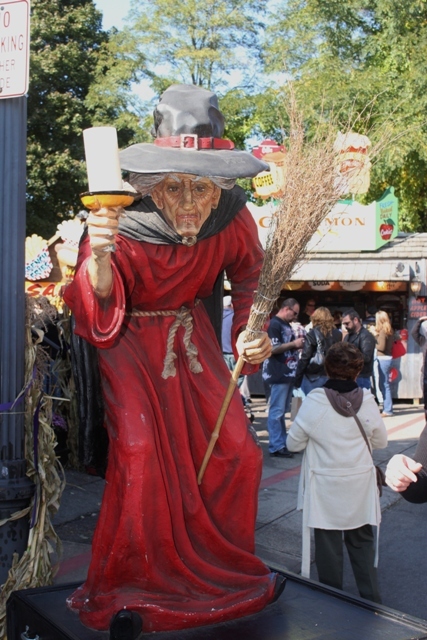 The Wicked Wonders of Salem! David A. here. Welcome to the final chapter of an excellent series of blogs started by Dave F. on his visit to my home state of Rhode Island this past October. I am a New Englander through and through…always have been, always will be. What is not to love? The summers are warm and beautiful and the winters are tolerable. 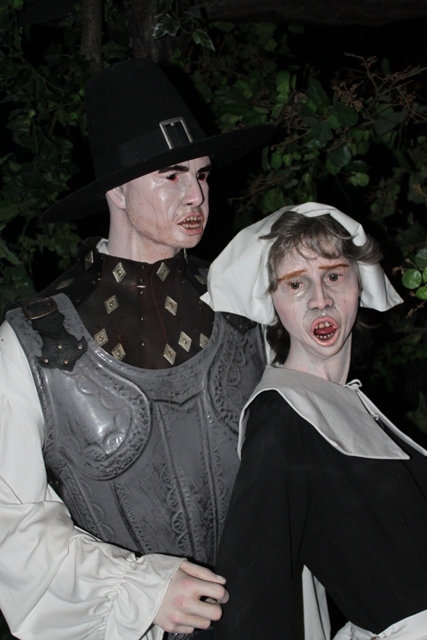 We have some of the best fall foliage ever seen and we also have some of the best “true” vampire stories in the world! We also have Salem. 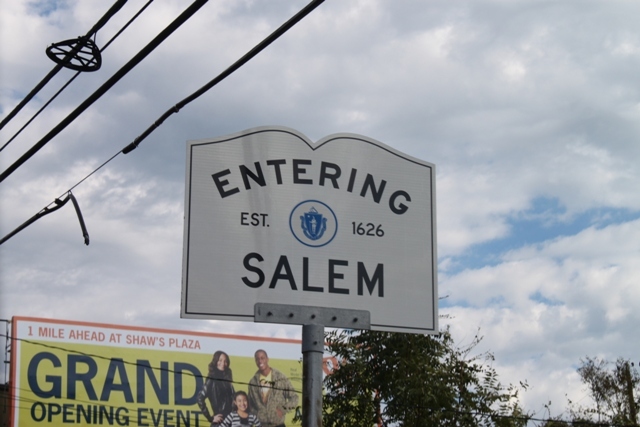 Salem, best known for its witch trials of 1692, is a place I always wanted to visit but never did. My problem is that I’m not a big fan of road trips, especially by myself and the majority of my New England friends do not share the same interests and enthusiasm for these types of things. 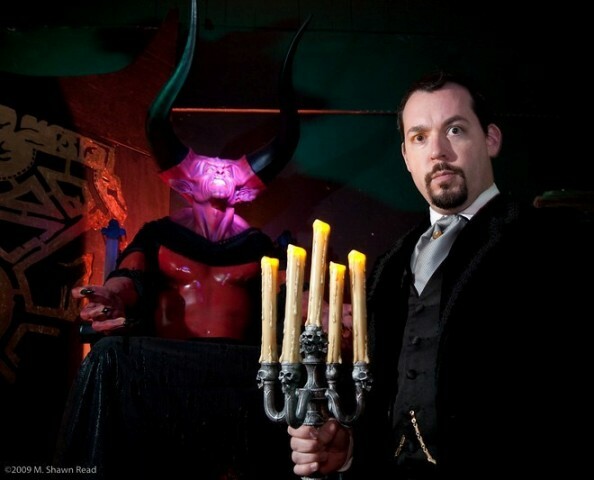 A friend of mine, James Lurgio, opened a monster museum in Salem in 2007 called COUNT ORLOK’S NIGHTMARE GALLERY. I have known James for many years and he considers me his influence, for better or for worse, in doing this kind of monster showcase. I had been promising him for years to come see his place but I always procrastinated going. I have the Rhode Island mentality…that a 30 minute drive is a road trip. Making the two hour drive to Salem just seemed at the time to be impossible (even though James does it twice a day, every day). In September of 2010 I finally made the long trek to Salem to see James’ place, with the intention of writing a piece about it for this website. If you haven’t read this piece you can check it out here. When I visited James that day I only visited his place (and to be honest, at this time, there was not much else going on in town). I was alone and was more interested in getting home then actually exploring. Little did I know that just a few weeks later I would be back in Salem, this time with someone who actually did share my interests and enthusiasm! When Dave and I made plans to hang out on the weekend of October 15-17 for the annual ROCK & SHOCK show in Worcester, I never thought that it would work out the way it did. Originally Dave was going to fly in on Friday and leave Sunday. 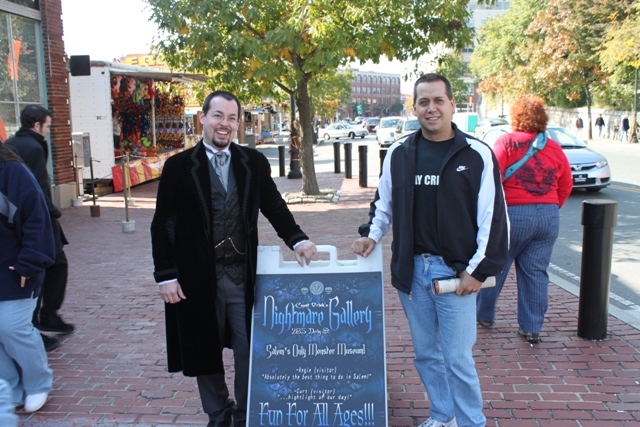 Thankfully, it was cheaper for him to fly out a day later, giving us an extra day to hang out…in Salem! The day ended up being perfect on so many levels. First off was the weather. It was sunny with temps in the 60’s…perfect for walking around! Plus, the hurricane-force winds we had been experiencing died down making the day even more beautiful. Second was the ride! What had been a long tedious drive to Salem the first time I went was now an enjoyable ride that flew by, thanks to Dave and the many conversations we had. It’s true when they say “time flies when you’re having fun” because the 2 hour ride actually seemed like 45 minutes. 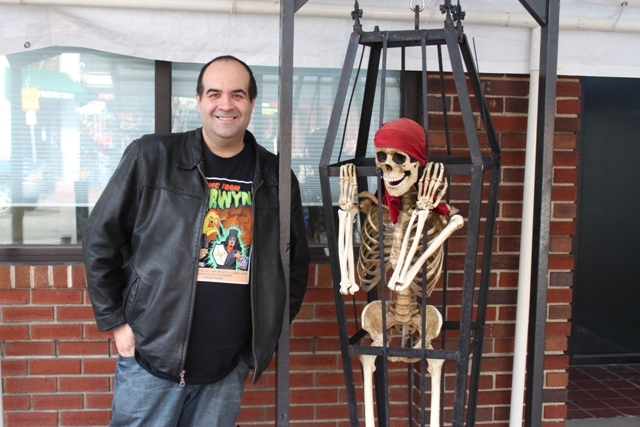 I think Dave and I both needed a day of escape…yes the ROCK & SHOCK show was a lot of fun but Salem was our time to bond and really get to know each other. We had both been going through some hardships and felt this website was the best therapy we could ever have asked for. We also found that we clicked really well, very quickly, which made it easy during the ride to and from Salem to talk…and to vent…and to feel better about ourselves. These conversations really made me realize that having Dave as a friend was something I had been looking for…for a very long time. The front of COUNT ORLOK’S NIGHTMARE GALLERY. When we arrived our first stop was James’ place. 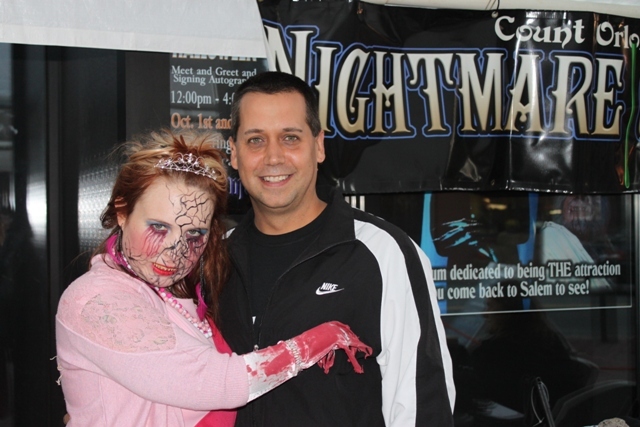 Dave F. had read my piece on NIGHTMARE GALLERY and was really excited about seeing it for himself. When we arrived James greeted us and was a very gracious host. He took the time to talk to Dave about the museum and was more than happy to answer any questions he had. Dave, like me, was very impressed with NIGHTMARE GALLERY (and we highly recommend it to anyone visiting Salem). James was also kind enough to present us with NIGHTMARE GALLERY t-shirts which was an unexpected, and much appreciated, surprise. Then James did us the biggest favor he could’ve…he took one of the Salem maps and circled all of the best sights to see. 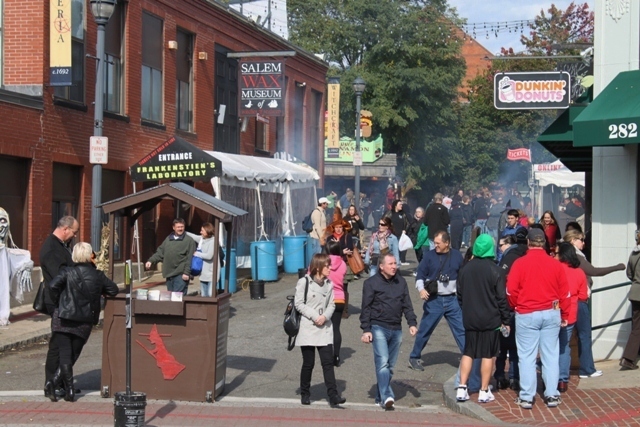 Now let me start by saying that Salem is LOADED with great sights and things to do, but when you only have an afternoon, you definitely want to visit the BEST places to start. This map was invaluable because not only did we see the cream of the crop (whatever that means) but we also did not waste money on things that may have been a disappointment! This really helped contribute to our perfect day. James and David A. outside of NIGHTMARE GALLERY. 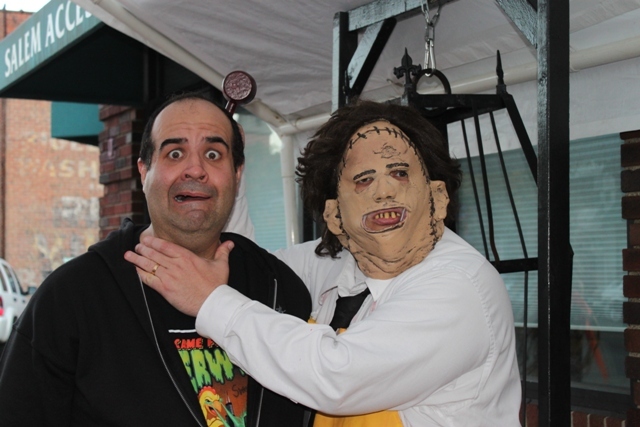 Dave F. posing with a new friend outside of NIGHTMARE GALLERY. 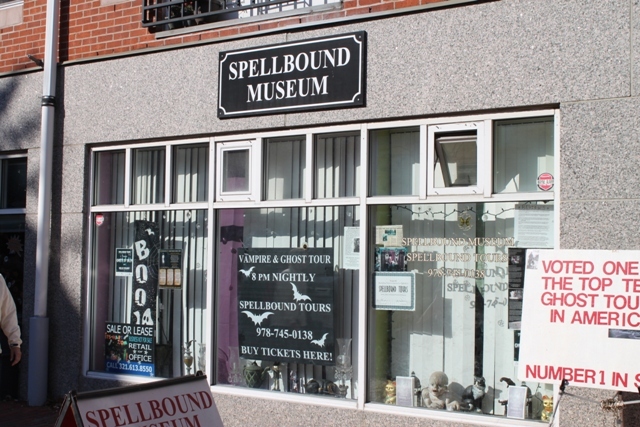 Before leaving on our walking tour of Salem, James also recommended that we come back after 3 PM as that was when his museum turns into a haunted attraction, with people jumping out at you. Sounded good to us! The first thing we had to do was find permanent parking for the day and then it was time to start exploring. Thankfully there was a parking garage less than a block down the street and our timing was perfect as we were one of the last vehicles in before the “Full” sign went up. Now we just had to figure out where we wanted to visit first! The view from across the street from NIGHTMARE GALLERY. 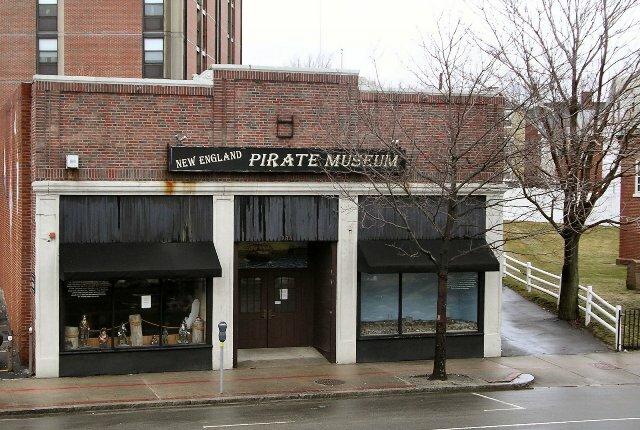 We decided, thanks to it’s location to the parking garage (right across the street), to visit the NEW ENGLAND PIRATE MUSEUM first. This was actually a great way to start our tour as they offered combination passes at a reduced price (I highly recommend keeping your eyes open for these combo passes when you visit Salem!). 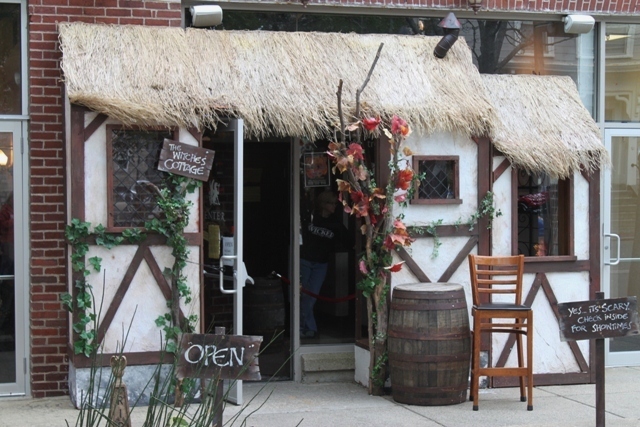 The pass we bought also included admission to two other locales circled on the map by James…the WITCH HISTORY MUSEUM and the WITCH DUNGEON MUSEUM. The pirate museum was fun and very interesting. 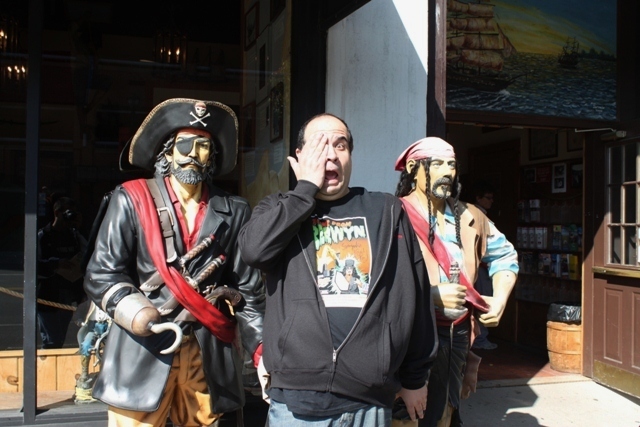 Personally I was not aware of all of the pirate activity in New England, in particular in Salem! Again, when you mention Salem most people think of witches, not pirates. 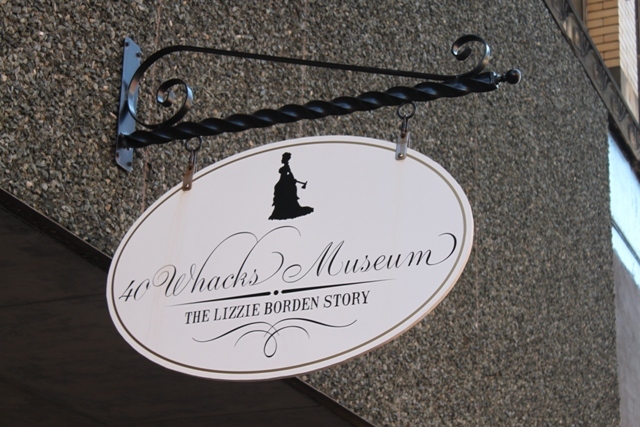 I do recommend visiting the museum as it is an interesting reminder of New England’s past! From there we decided to walk around a bit since our next stop was a ways off. 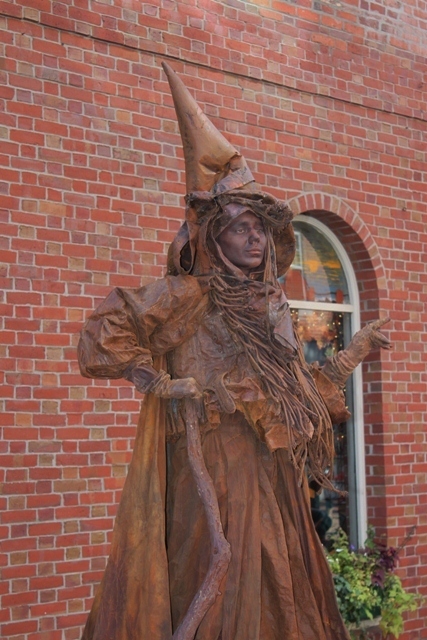 We visited various gift shops and people watched (Salem is a great place for people watching). 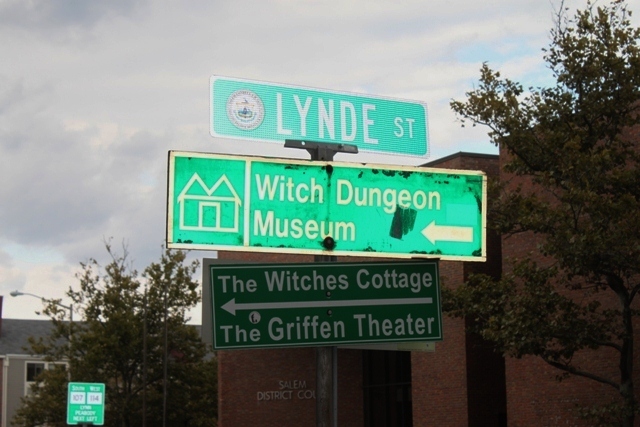 The first area we explored was Liberty Street, home of the SALEM WAX MUSEUM, FRANKENSTEIN’S LAB and THE SALEM WITCH VILLAGE. This was actually a fun area to explore. There was a huge concentration of people and lots of things to look at, even if you didn’t go into the actual museums or FRANKENSTEIN’S LAB (a walk thru haunted attraction). The gift shops are always fun but I do wonder how the year-round locals feel about the commercialization of such a tragedy. I mean do you really need an ashtray or shot glass with the image of a witch on it? 19 people were falsely put to death and to celebrate they get an ashtray??? 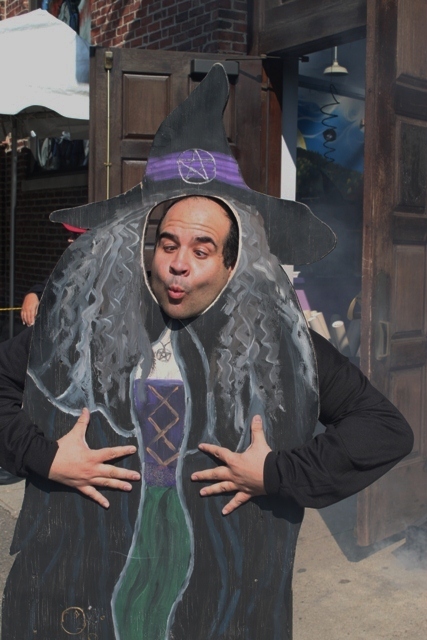 I do understand businesses trying to make money and that they only are really able to from September to October (their busy tourist season) but maybe they should be a little more selective on what they stick the image of a witch on…but that’s just me. 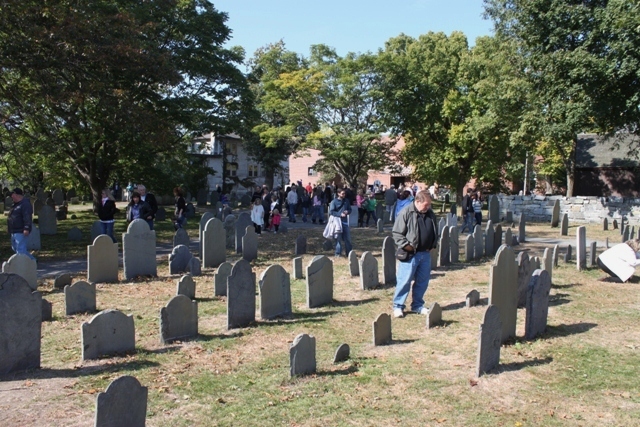 Our next stop was the Old Burying Point Cemetery. 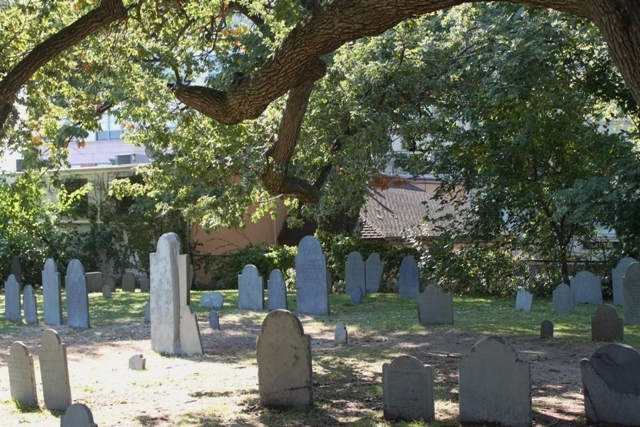 This is the oldest cemetery in Salem and it contains many famous individuals, such as Jonathan Corwin and John Hawthorne, who were judges in the Salem witch trials. I myself love old cemeteries, the older the better. Rhode Island is known for its historical cemeteries, so seeing this one was interesting to me. It has a great look and I bet on a clear, moon-lit night it is quite the place to see. We spent a little time here before heading to Essex Street, the home of the Museum Place Mall and some great street performers. For anyone that has visited Salem, you know that Essex Street is pretty much the busiest section, with Liberty Street being a close second. This street not only has the Museum Place Mall but it is lined with all kinds of neat shops and there are plenty of street performers to keep you entertained as you walk around. 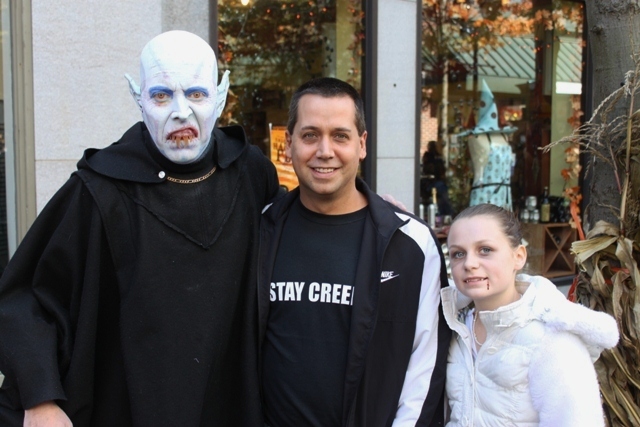 Right away we noticed a father/daughter team dressed as vampires and I immediately had my picture taken with them. From there we saw an amazing woman dressed as a bronze statue and she towered over the crowd, standing perfectly still for long periods of time before moving, and scaring the crap out of people who swore she was just a statue. Her costume and makeup are quite elaborate and I give this woman a lot of credit as what she does is not as easy as it seems. When you see these people, make sure you tip them – they deserve it! 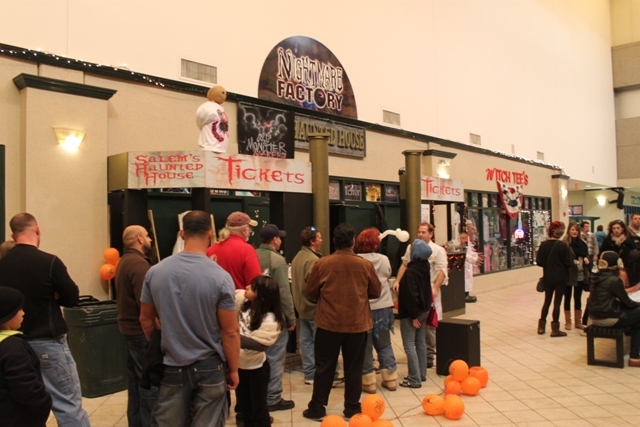 From there we entered the Museum Place Mall, with the intention of visiting NIGHTMARE FACTORY, a walk-thru haunted attraction. I found this to be a fun and entertaining haunted house, especially since I really didn’t get to visit many haunted houses this past Halloween season. 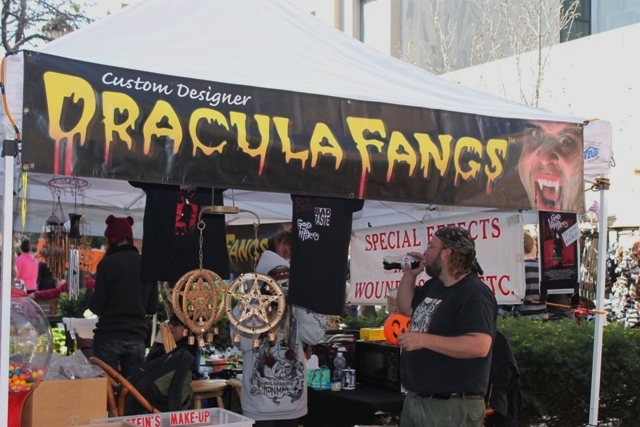 Because it is in the mall, it does have an advantage over other haunted attractions…it can open during the day! From there we explored the mall a little more and then went back out onto Essex Street, visiting the various stores of interest and then grabbing a quick bite to eat from one of the vendors. 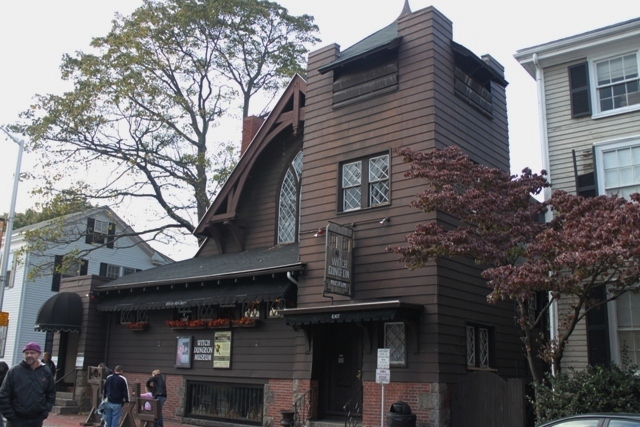 Our next stop on Essex Street was the WITCH HISTORY MUSEUM. 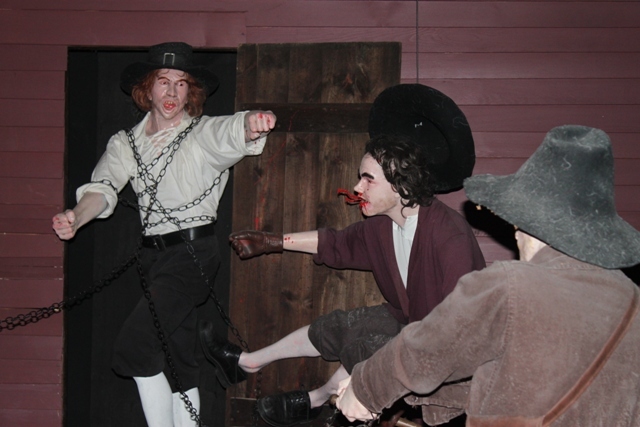 This museum was very interesting, featuring 15 life-size scenes depicting the stories of Salem in 1692. I guess people were really homely back then. I love this “action” shot with the blood coming out of the mouth. 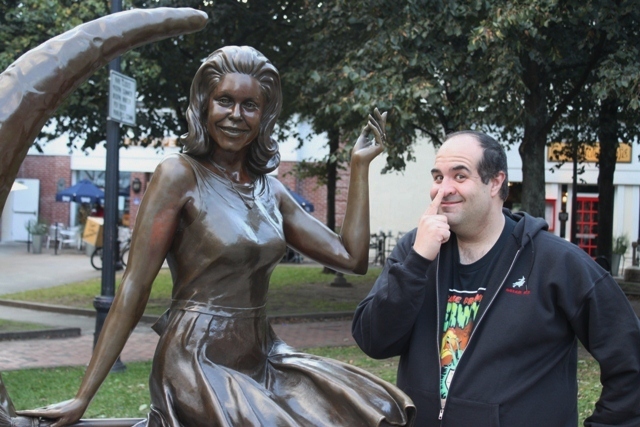 After leaving the WITCH HISTORY MUSEUM, Essex Street led us right to the next thing we wanted to see…the Samantha Statue (that’s right, Samantha from BEWITCHED)! I was never a big fan of BEWITCHED to be honest…I just found it to be too hokey and not very funny (but that’s just me). Both Dave and I did want to see the statue if, for no other reason, it was featured in one of our favorite episodes of “Penny Dreadful’s Shilling Shockers.” The statue was presented by the cable television station TV LAND and it is quite the popular attraction! The statue can be found on the corner of Essex and Washington Street. Our next stop was on Lynde Street, for THE WITCHES COTTAGE. We had no idea what to expect here but this ended up being one of our favorite places that we visited. It is basically a stage show on the supernatural and all I can say is WOW!!! And I know Dave F. felt the same way. The people that put this on really have to be commended as I cannot give this performance enough hype! When you go to Salem you MUST see this show!!! Unfortunately they do not allow photography here so all I can share is some pics we took outside of THE WITCHES COTTAGE. After leaving THE WITCHES COTTAGE in awe, all we had to do is cross the street to our next destination…the WITCH DUNGEON MUSEUM. This started out as a live stage show, re-enacting the trial of beggar woman Sarah Good, from the original court transcript of 1692! 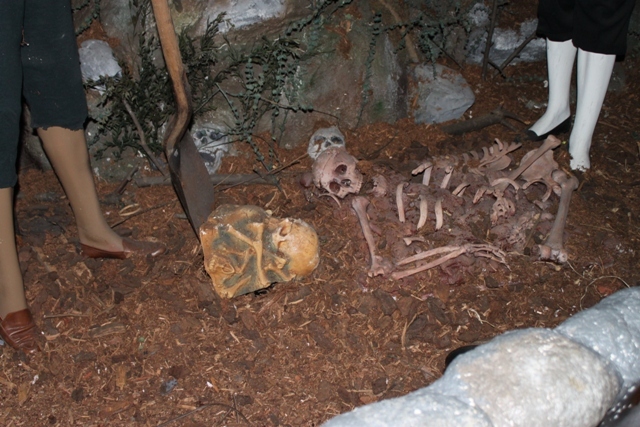 From there you are given a guided tour of the dungeon itself, which includes very detailed sets and props. As we left here we knew our day was coming to an end, with only two more places to visit…a witchcraft store and then back to NIGHTMARE GALLERY for the haunted house tour. 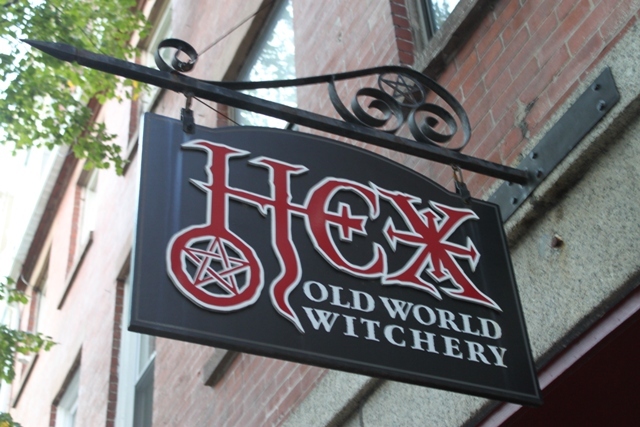 Dave and I had visited some stores over the course of the day that feature witchcraft materials but none of them compared to what the store HEX had to offer!!! 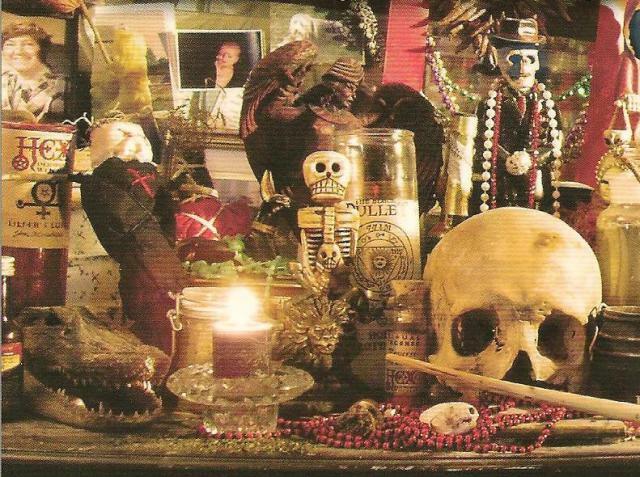 If any of you are fans of the television series BUFFY THE VAMPIRE SLAYER then you are aware of The Magic Box, a magic store on the show that sold things for spells and all kinds of supernatural goodies. HEX is The Magic Box…but for real. This store is in my top 3 things to see in Salem (along with NIGHTMARE GALLERY and THE WITCHES COTTAGE). If this store was closer to home I would go there all of the time! There was just so much to look at and it was all fascinating. The workers there were also extremely friendly and helpful, going out of their way on more than one occasion to help us out with our questions. 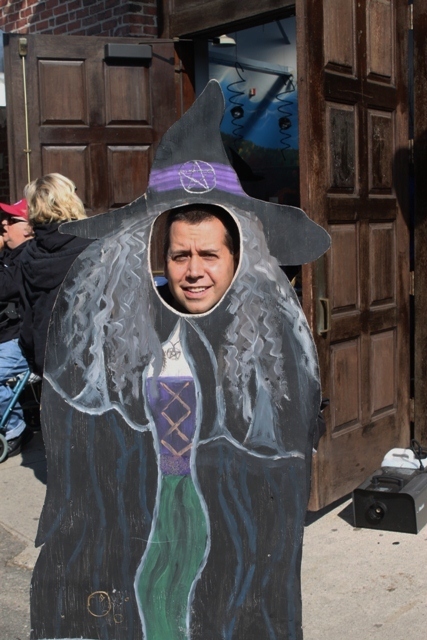 If you want to see the real thing…then go to HEX!!! This was part of an altar that featured a real human skull and all kinds of lit candles and spells that were cast for people. Me in HEX. We didn’t want to push the picture taking because many stores didn’t allow it. After leaving HEX we headed back to Derby Street for our last stop for the day, before our trek back to Rhode Island. 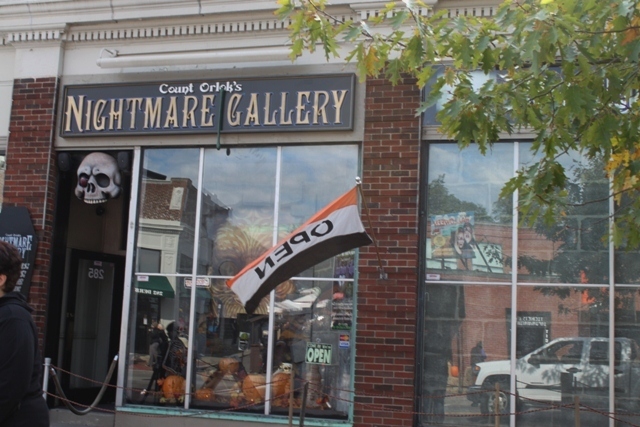 It was now time to visit NIGHTMARE GALLERY once again, to see it as a haunted attraction. James does this especially for the people who do not appreciate what a museum of classic monsters has to offer. I will say it’s a completely different experience…but no less fun! First off the whole museum was A LOT darker, making it more difficult to navigate and second, now there were live ghouls in there with you, ready to jump out from every dark corner (and there were a lot of them). What made the experience even more fun was that James warned the actors that we were there so that they would very often come right at us yelling our names, personalizing the whole experience. Of course it was probably a lot easier considering we both had the same name! This was the perfect way to end the day…a day that I can only describe as perfect. 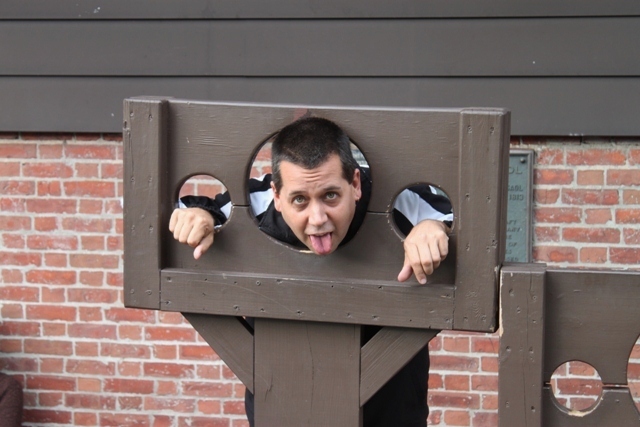 My only regret was that it was coming to an end, as was Dave F.’s visit to New England. Me and my new girlfriend Kelly…HAHAHAHA! The ride back went by just as fast as the ride up. It was finally nice to have a friend with so many of the same interests and this weekend really cemented our friendship. The talk during the ride home covered many topics…the past 2 days, this website, future projects and conventions we wanted to go to and many other things. When we got back to my house we attempted to watch an episode of ZOMBOO’S HOUSE OF HORROR MOVIES but we were so exhausted from walking all day that we called it a night pretty early. Monday morning came way too quickly which meant that Dave would be leaving in a few hours. We went for breakfast before going to the airport. Though we were still excitedly talking about all of the fun we had had the days previous, the mood was somber, knowing that it was all coming to an end. Overall though the weekend was one of the very best weekends I had had in a long time and I think Dave agrees. 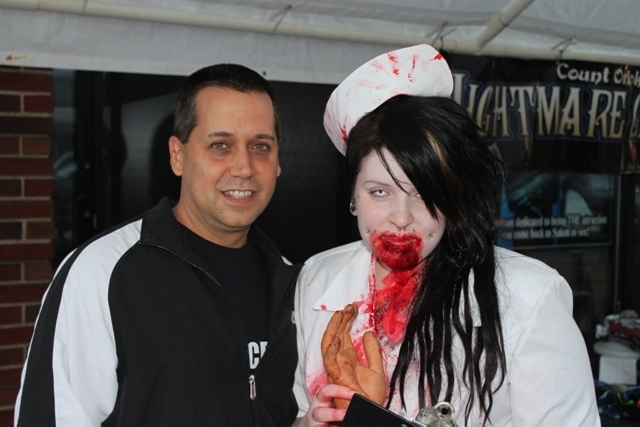 Now we have the March 2011 HorrorHound weekend in Indianapolis to look forward to and neither of us can wait! This entry was posted in Terror Daves on the Road!, Weird USA and tagged 40 Whacks Museum, Bewitched, Count Orlok's Nightmare Gallery, Dave Fuentes, David Albaugh, Dracula, Elizabeth Montgomery, Essex Street, Frankenstein's Lab, Hex: Old World Witchery, JAMES LURGIO, John Hawthorne, Jonathan Corwin, Leatherface, Lizzie Borden, Lynde St., NEW ENGLAND, New England Pirate Museum, Nightmare Factory, Old Burying Point Cemetery, Rock & Shock, Salem Wax Museum, Salem Witch Museum, Salem Witch Village, Texas Chainsaw Massacre, The Witches Cottage, vampire, Witch History Museum, Witches, Witches Altar. Bookmark the permalink. ← “GIRLFRIEND FROM HELL” – An ’80s Cult Classic! I truly appreciate this post. I have been looking all over for this! Thank God I found it on Google. You have made my day! Thanks again.